Each year my dad and I make time for a hiking holiday together. This is our daddy-daughter time, and as I’m in Leeds and he’s in Buckinghamshire it serves as a much needed catch up. While we walk we talk about general daddy-daughter gibberish, updating each other on our separate lives and the people in it. Although for the most part mundane, these are the conversations that have shaped many aspects of my life… the best advice is given on top of mountains, especially when it’s from your Dad! A lot of time we don’t talk at all and just enjoy each other’s company, the stunning scenery, and the cute wild animals (well, that’s mainly me squealing over a tiny calf whilst my Dad rolls his eyes). 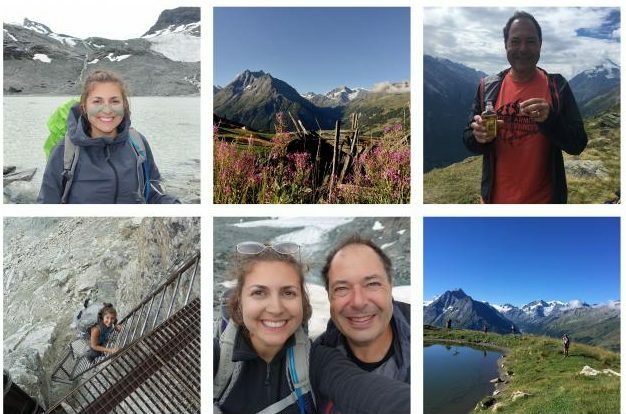 This year we spent a week in the Alps, walking from Mont Blanc to the Matterhorn. 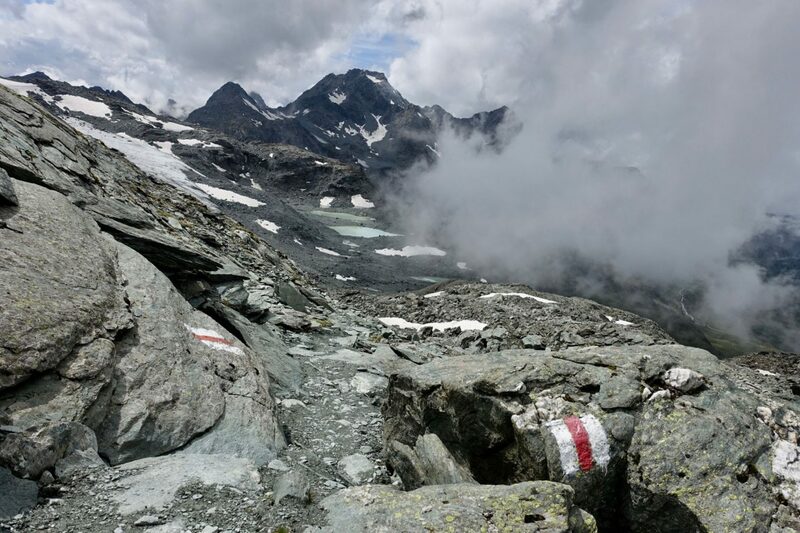 If you’re thinking about visiting Switzerland for an outdoor adventure, please read on! This is certainly a trip that you could book yourself, researching the route and the best places to stay with good old Google and a guide book. The route is really easy to follow with painted rocks guiding the way, and the limited accommodation means that you don’t need to do that much research when deciding where to stay. You get your own guide to lead you along the route, meaning that you don’t even need to be able to read a map (I’m useless at this kind of thing despite my Dad’s best efforts). This is also hugely helpful if there are any issues such as path closures or bad weather. You’ll be in a group with others who have booked onto the holiday, meaning that you get to meet like-minded people. Great for taking pictures of you at scenic spots! This holiday was truly beautiful… from Alpine meadows to rocky mountains to snowy glaciers to amazing wildlife (I’d never heard of a marmot but they’re so cute and now I want one), this trip had everything. It wasn’t as difficult as previous hikes I’ve done (or maybe I’d trained harder?) which meant that I could fully enjoy the surroundings rather than wonder how much further until the top of the mountain. Our route started in a village called Argentiere in the Chamonix Valley, where we had an incredible view of Mont Blanc from our chalet and for the first half of the day. We spent the day walking through meadows and forests with a couple of cable cars thrown in for good measure. We passed through Verbier and a random sculpture park, before arriving at a mountain hut for the evening. We had to sleep in a dorm but the views were worth it. Over the next few days the sound of cowbells was the joyful background to our adventure which included steep climbs, slipping on snow patches, natural clay face masks, shots of Génépi (a local herbal liqueur made from alpine plants) to warm up on mountain tops and, my personal highlight, climbing up ladders on the side of mountain faces. After passing through countless beautiful alpine villages, we eventually concluded our adventure in Zermatt, with stunning views of the Matterhorn. 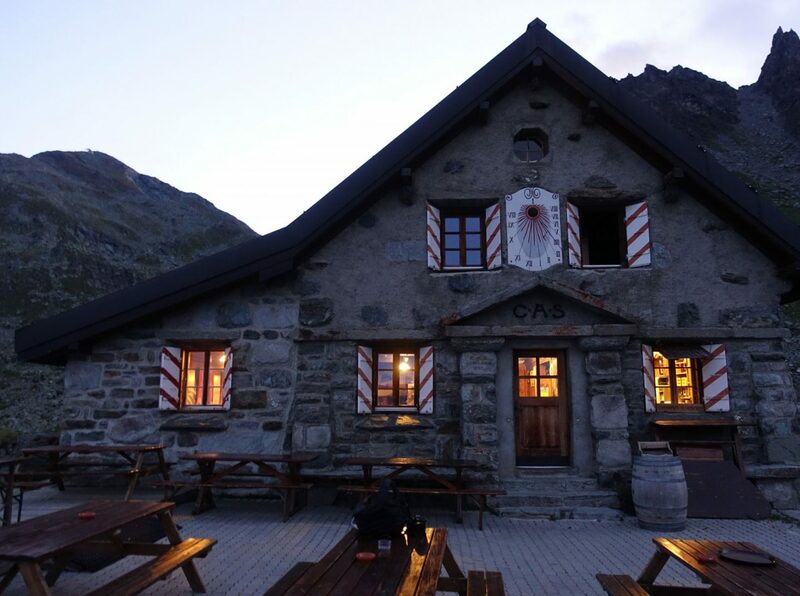 I wasn’t expecting the food to be great because we would be spending time in mountain huts, where a small kitchen cooks en masse with limited ingredients for a load of hungry hikers. I was SO WRONG! 1. 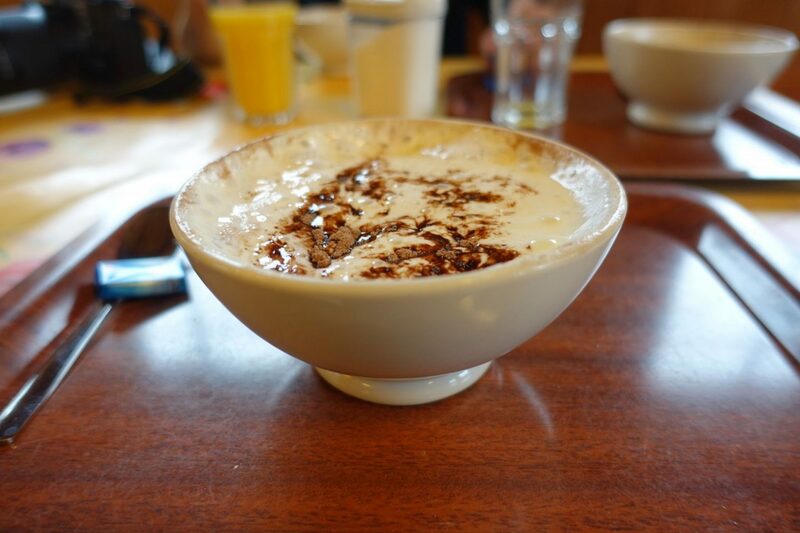 Hot chocolate with rum: the BEST way to celebrate a completed day of snowy hiking in a mountain hut. 2. 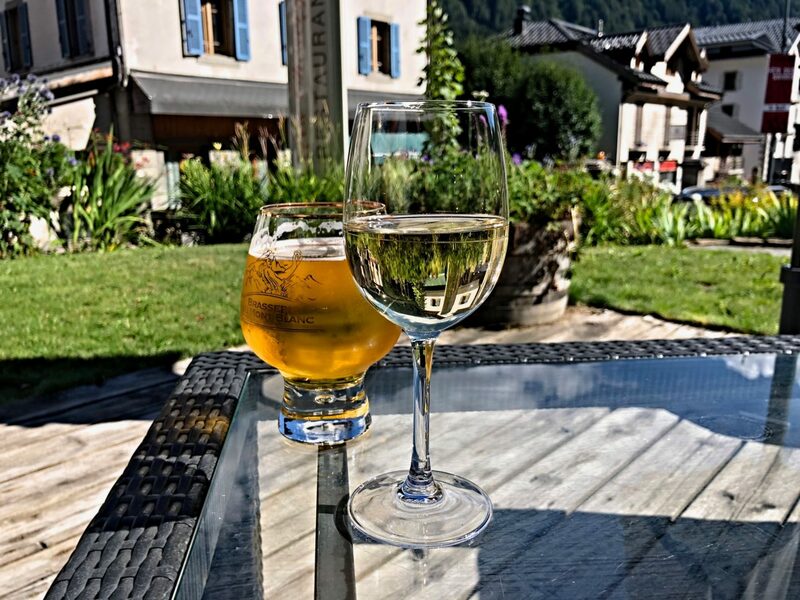 Swiss wine… I had no idea! My favourite was called Fendant and I couldn’t get enough of it. 3. Cheese, cheese and more cheese. 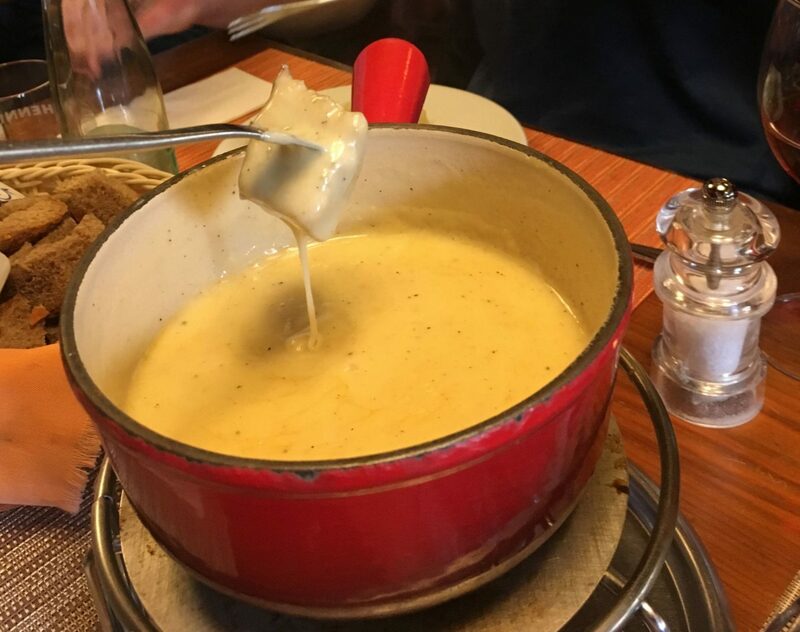 As well as the cheese sandwiches mentioned above, cheese highlights included my first ever cheese fondue and a spinach and ricotta pasta covered in SO MUCH CHEESE and baked. Heaven. So what’s next? The one negative of this trip was jealousy. As we walked beneath the glaciers all I wanted to do was climb up and cross the ice, and I was jealous hearing people talk about their cramp-ons and ropes. So next year Dad and I are taking our hiking to the next level with some proper glacier climbing in the Italian Alps! We’re not going until next summer, but I’m already super excited. Have you ever climbed a glacier? I’d love any advice or recommendations on where to go so please get in touch or comment below.